WeChat public platform is established to mainly serve celebrities, government, media or enterprises. It is like a digital blog in China. Thousands of articles are uploaded to public everyday including news, campaigns, and personal comments. Audience can freely subscribe for WeChat channel. After that, the owner of this channel can promote its news as they want. Register to be the owner is also for free. It gets easier now to promote the brands on wechat platforms and it can develop the opportunity to cooperative businesses. Why is WeChat platform important? 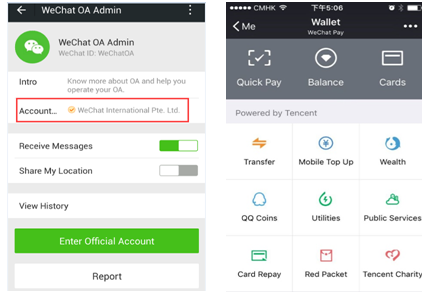 WeChat public platform provides a better user experience.It can send notifications to the audience. Here brand can communicate and share their personality, attitude and brand information to the audience. Also, WeChat can do mass data-pushing, auto-response, QR code subscription and lead the functional positioning of the official account. Imagine you have found a very interesting content on WeChat platform, you might want to recommend to your friends. What’s interesting is when you share this content, you also shared the “one-click” subscribe of this platform. And all those steps are for free, that means, if you have enough great content, you can even collect thousands of fans for one day! I mean, who will refuse free promotion? Why does the influencer matter to you? Let’s first have a look at the data below. Maybe you don’t fully understand what the data means, let me give you a metaphor. In 2017, the turnover on Wechat (191.1) is more than 6 times that entire Australia food & beverage industry (32.29 billion) (Statistics). 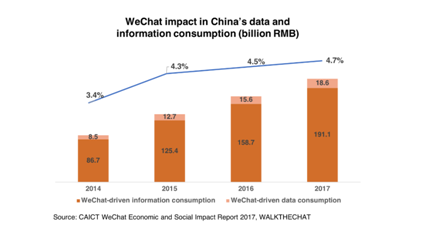 The information economy driven by WeChat has reached RMB 209.7 billion, accounting for 4.7% of China’s total information consumption. According to WeChat, as of September 2017, the official account number of WeChat has reached 20 million, and the active official account has reached 3.5 million. Moreover, data shows that 61% of users open WeChat over 10 times per day, 21% of users open WeChat more than 50 times each day. That means, only 5% of users never open it. The huge number of potential customers with a convenience payment method can lead to a high rate of return in a short time. iSynergi is primarily to use WeChat to assist in the provision of tailor-made WeChat marketing strategies. By signing up and filling the profile on the WeChat platform, we can help reach the potential consumers quickly. To increase the directly sales, we can help generate a small program in a short time (see what is Wechat mini program). Creating content is not difficult for us. We have professional Chinese marketing group here to help you create original content to appeal the consumers. For more information and problems about WeChat marketing campaign, you can contact us to seek for the most quality and effective solution.